A traditional dish served during the Christmas season in Sweden. 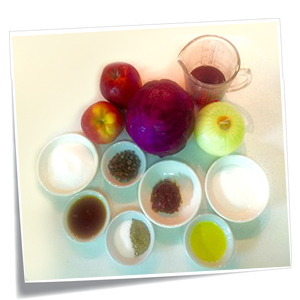 Pair the Swedish red cabbage and apples with Finnish meatballs or as a side dish with just about anything. A bright and colourful addition to your festive holiday dining! Easy to make in advance. This dish is actually better the next day. 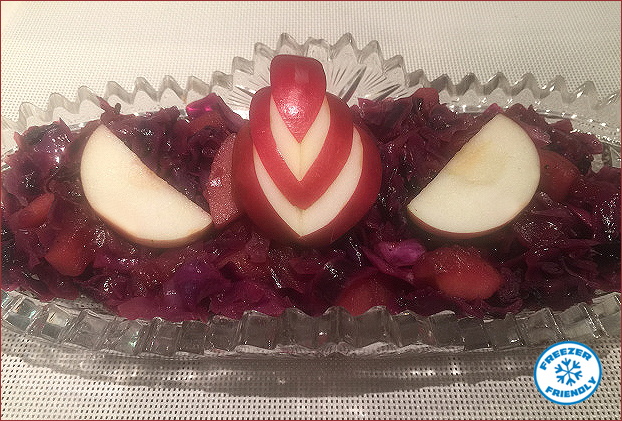 Enjoy your red cabbage/apple dish in the summer since it is equally delicious served cold. Any leftovers will disappear quickly from your fridge. Note: I have used olive oil instead of the traditional butter, so you can served cold. Yumm!!! I try not to overcook this dish as texture is a very important part of food appreciation. Crunchy and chewy textures slow you down and help you eat more deliberately and more joyfully. Red cabbage is an excellent source of vitamins C and K and a very good source of fiber, folate, vitamin B6, and omega-3 fatty acids. It is also a good source of vitamin B1, B2, calcium, vitamin A and protein. One cup of boiled cabbage has just thirty-three calories. Cabbage is good for reducing your risk of cancer and possibly of Alzheimer’s disease. In the laboratory, red cabbage protects against oxidative stress in the brain, reducing the buildup of plaque and again reducing the risk of Alzheimer’s. Also, a Chinese study found that women who ate the most cruciferous vegetable such as cabbage were at half the risk for breast cancer as those who ate little or none. Reminds me of the red cabbage I used to eat in Germany!